more info please No where in your description of this product do you mention the weight limit for dogs. Most Snoozer car seats state whether they're for dogs up to 25 lbs, or over 25 lbs. It's important to mention this in your description so customers don't assume their dogs will fit in it. 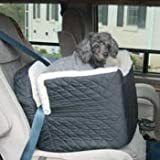 Snoozer Pet Car Seat Lookout (Misc. )Bought this seat several years ago and it was a big success with our Bichon who didn't know what it was to be able to stick his nose out the window and feel the wind in his face. Now when we say, "Want to go for a ride in the car?" he's the first one at the door.